This story takes place roughly 700 years in the future, when humanity has spread out among the stars. On the planet Hyperion, a powerful murderous being called the Shrike (or Lord of Pain) inhabits the Time Tombs, which travel backward in time from some distant point in the future. As the Shrike had not appeared for years, researchers including 25-year-old Rachel Weintraub, Sol’s daughter, study the Time Tombs. After a mysterious accident, she begins to age backward. Every 24 hours, she is one day younger, with no memory of her condition or anything that has happened in her life passed her new age. Meanwhile, Sol begins to have the dream described earlier, and he believes it comes from the Shrike. He refuses, but as the daughter nears the beginning, and therefore end, of her life, he decides to travel to Hyperion to deny the Shrike in person. Angry, he also takes issue with the God of scripture, deducing it is unethical for Him to command Abraham to sacrifice his son Isaac. He talks with rabbis and finds the idea that God requires obedience to be repulsive. Though reasonable and common, Sol builds his objections on popular misunderstandings of sacrifice, obedience, and God. He basically identifies God (like many do) as the most powerful being who therefore demands submission from everyone else. Why should anyone follow him? While scripture and orthodox theology describe God as all-powerful, he is not just another person like us who happens to be the strongest. A proper understanding of God must rest on the idea that He is Goodness, who yes, happens to be a person as well. Jesus’s disciple, John, writes “God is love” not “God is loving”. He is Love. He is Goodness incarnate. With this definition, asking “Why should we obey God?” is logically equivalent to asking “Why should we do what is morally good?”. Hence, the obedience God commends is not simply doing what you’re told. There is no virtue in that, and history attests to the horrors of just following orders. True obedience to God, however, involves believing in transcendent, objective Goodness, and choosing to act in accordance with it. This Goodness, or Love, requires many actions such as forgiveness, helping others, and yes, sacrifice. Hence, the personal incarnation of Love, God Himself, commands the same. Lastly, Sol views sacrifice in a most odd way. He imagines a world in which no one will sacrifice for anyone, but that cannot happen. Could you even imagine a world in which a momentary denial of one’s desires would never be needed for long term happiness? Or a world in which helping others would never require expending your own time, possessions, or effort? As long as people have needs and constraints, life and love requires sacrifice. On Hyperion, the night before Rachel ages backwards to her birth, Sol has his reoccurring dream, but now it continues past the usual point. After he refuses, the voice tells him humanity needs the sacrifice, which Sol dismisses. Then, his eight-year-old Rachel appears and implores, “say ‘yes’, daddy”. Moments before her expected death, the Shrike appears, ready to receive Rachel. Sol remembers his latest dream and his daughter’s exhortation. He reasons, “loyalty to those we love is all we can carry with us to the grave. Faith, true faith was trusting in that love”, and hands her over. I much rather sacrifice to Incarnate Goodness than that thing. In other words, Sol sacrifices because he trusts his daughter. Well, of course! Trust must be the basis of sacrifice or any act of obedience. As Jesus’s brother, James, writes, “Was not our father Abraham considered righteous for what he did when he offered his son Isaac on the altar? You see that his faith and his actions were working together, and his faith was made complete by what he did” (James 2:21,22). Our actions, i.e. obedience, flows from our faith, i.e. trust. God does not ask us to obey him like some drill sergeant, simply because we’re told. He asks us to trust him, to trust His Goodness, which results in doing what He says. After hours of waiting at the same spot, hoping Rachel would somehow return to him, an adult Rachel appears carrying the infant Rachel who now ages correctly. The adult explains that Sol and the baby will enter a portal to the distant future, where he gets to raise her (again). She will then travel backwards in time to constrain and eventually defeat the Shrike, saving humanity. Before entering the portal, Sol exclaims, “By God, it was all worth it, wasn’t it?”. Now, he understands sacrifice. Sacrifice involves giving up something difficult to bring about a better result, not placating the whim of a powerful being. We sacrifice to God because we trust His character and trust He will use our sacrifice to bring about a good outcome, whether for us or others. Let’s apply Sol’s insight to the story of Abraham and Isaac, which you can read here in Genesis 22. Did God expect obedience without trust? Of course not! Nearly every interaction with God prior to this moment has centered on growing and commending Abraham’s faith. Expounding on the degree to which Abraham trusted God, the author of Hebrews later concludes, “He who had embraced the promises was about to sacrifice his one and only son, even though God had said to him, ‘It is through Isaac that your offspring will be reckoned.’ Abraham reasoned that God could even raise the dead, and so in a manner of speaking he did receive Isaac back from death” (Hebrews 11:17-19). Would Abraham, like Sol, consider it worth it? Of course. The interaction strengthens his faith that “the LORD will Provide”, and he received an extravagant blessing for his trust and obedience: “through your offspring all nations on earth will be blessed, because you have obeyed me.”1 Many others have since shared in the benefits of Abraham’s sacrifice, as many would benefit from Sol’s. 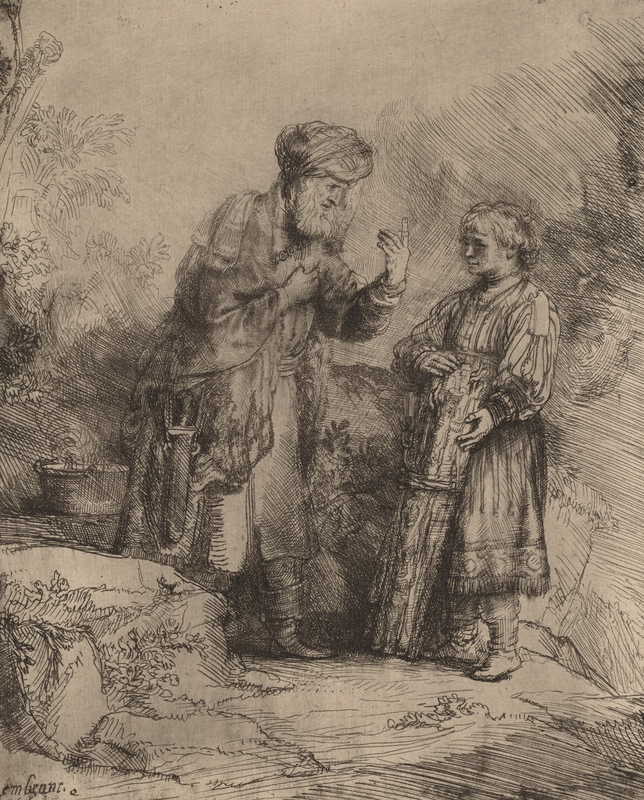 With prophetic foreshadowing of Christ, Abraham explains that God will provide the lamb for the sacrifice. While the second point might seem obvious to a modern reader, many people and cultures practiced child sacrifice in the ancient Near East. Adherence to this lesson, contained in both the Mosaic Law and this foundational story for the Hebrew people, likely saved countless lives in following centuries. As Sol argues with God (or his “subconscious interlocutor”) in Hyperion that one must never kill an innocent, the latter retorts, “Perhaps this is part of the lesson which Abraham needed to learn before he could be father to the blessed of the nations of the earth.” Indeed, his society needed this lesson desperately. First, how do you feel about sacrifice, obedience, and God? If you don’t like these terms, could it be the ideas you reject are not the ones found in scripture but our culture’s misunderstanding? You may be falling victim to an unintended straw man fallacy. Instead, make your best attempt to understand the claims of scripture and then evaluate them. Second, with a new understanding of terms, what must you sacrifice to bring about a greater good? If you find this difficult, how could trusting God and focusing on the positive outcome help you?